It’s the 15th of the month, and I have a new post at PreK + K Sharing. 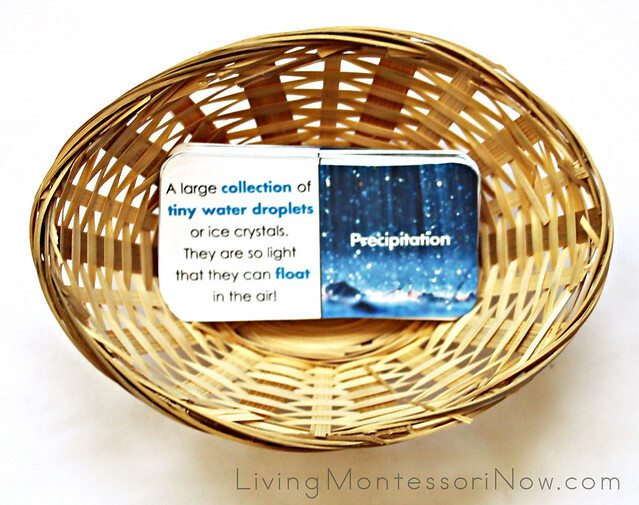 Today, I have some Montessori-inspired water cycle activities using free water cycle printables … perfect for spring. They’re also great for Earth Day if you talk about water conservation. Here, I’m sharing the links to lots of free water cycle printables for preschoolers through 1st graders (and sometimes older). I’m mainly sharing links that are specifically related to the water cycle along with a few large weather packs. 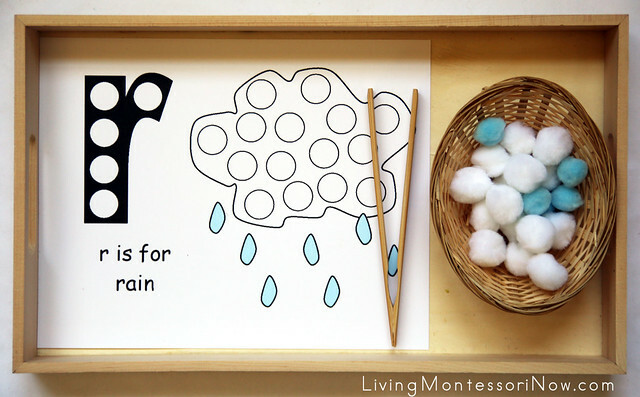 For this activity, I used the free r is for rain Magnet Page from Making Learning Fun. 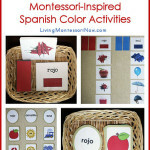 The tray for this activity is a Multicraft tray with a Montessori Services basket. I added a toast tong for a practical life component and pom poms for the transferring and phonics activity. For the “r” is for rain part, I always emphasize the phonetic sound (/r/ for rain) rather than the letter name. I like that this printable uses the lowercase “r,” which is consistent with the way letters are introduced in Montessori education. My 17-month-old granddaughter is getting past the mouthing stage, so I allowed her to work with the activity (with supervision, of course). I showed her how to put the cotton balls on the cloud circles and then let her use her hands to transfer them from the basket to the cloud. She spent some time exploring the texture of the cotton balls, and she also enjoyed transferring the cotton balls. 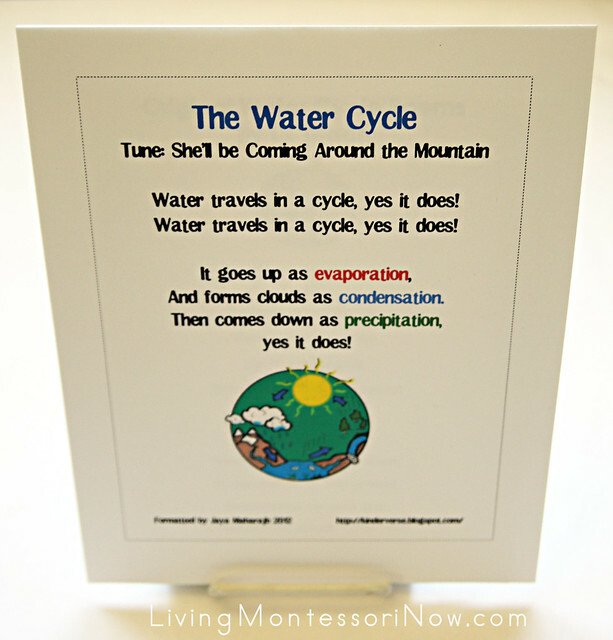 This activity uses the free Water Cycle Song Handout (tune: “She’ll Be Coming Aound the Mountain”) by Jaya Maharajh at Teachers Pay Teachers, Water Cycle Song (tune: “The Wheels on the Bus”) by Susan Barr at Teachers Pay Teachers, and Water Cycle Poems by LR Teach at Teachers Pay Teachers. 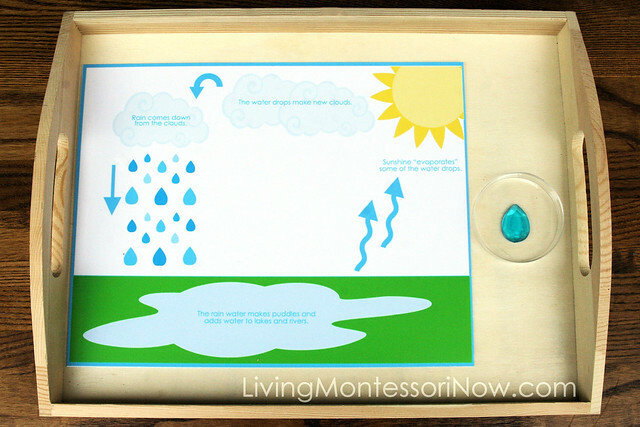 I added them to a tabletop easel I would place on the shelf with the other water cycle activities. Children who can read can use the printables to learn the songs and poems. 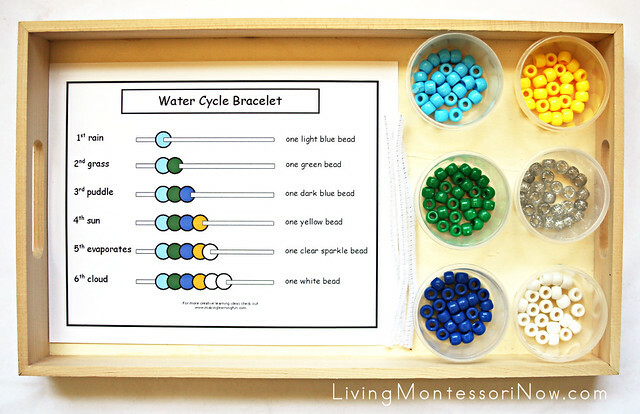 This activity uses Water Cycle Beaded Bracelet (good for younger preschoolers) from Making Learning Fun and The Water Cycle Bracelet Project (good for advanced preschoolers and kindergarteners) from Mrs. Kimbrell’s Kindergarten. I added the printables for both levels along with colored beads in small containers and pipe cleaners to string the beads on. Making a water cycle bracelet is a great way to reinforce the water cycle. Children can string more than one set of beads, since the water cycle is continuous. 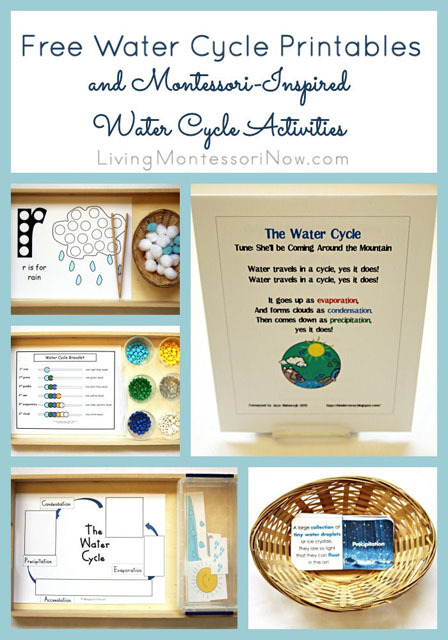 For this activity, I used The Water Cycle Chart and Activity by Meaghan Kimbrell from Mrs. Kimbrell’s Kindergarten (blog post) (free printable at Teachers Pay Teachers). This part of the printable can be used more like a puzzle. It can also be used as a cut-and-paste activity. 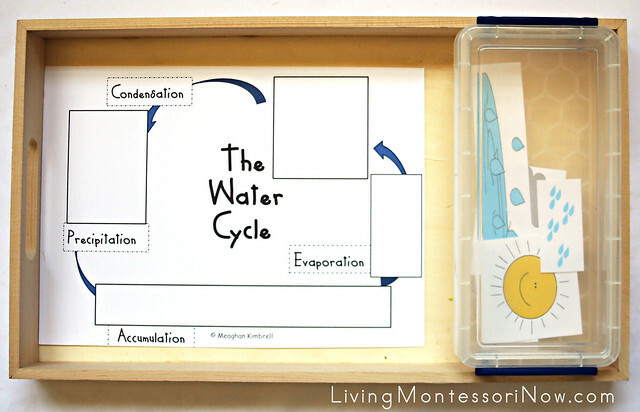 This activity uses the free Water Cycle Dominoes by Erin Bittman at Teachers Pay Teachers. 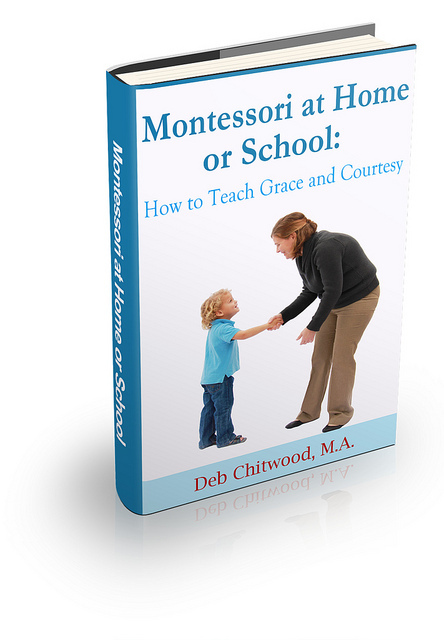 This is an advanced activity that’s best for first graders or advanced kindergarteners. I loved the activity and had fun laying out the dominoes. It’s a great way to reinforce knowledge learned in a water cycle unit study. How amazing is Water Cycle Dominoes, such a brilliant idea!!! Thank you for stopping by at Kids Learning Printables Linky Party! Great resources! Thanks for linking up at the Thoughtful Spot Weekly Blog Hop! We hope you join us again next week!